We are happy to announce a new release of MaxAim DI (4.10). Featuring XInput support for full compatibility with XBox 360 controllers and accessories, no more conflict with the right and left triggers! And also: XInput Force Feedback and Ctrl-M shortcut to streamline the mouse configuration while in Capture Mode. Thank you so much to all who contributed with suggestions to improve the MaxAim plugin. Play PS4, XBox One, PS3 and XBox 360 games with keyboard, mouse, steering wheel, driving wheel, flightstick, fight stick, joystick and so on. Now, with DirectInput and XInput compatibility, you can use any game controller of your PC. Including steering wheels, driving wheels, flightsticks, fight sticks, joysticks, etc. Just bind the DirectInput entries to the MaxAim DI controller layout and you are ready to go! Battlefield 4 Multiplayer with Titan One and Gamepacks! 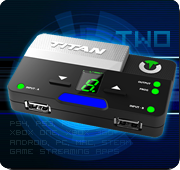 Featuring the Titan One with Battlefield 4 Gamepack enabled playing online multiplayer against real opponents. 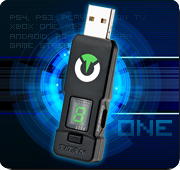 Titan One unleashes the power of your video game controller. The crossover feature allows you use your favorite controller on Xbox One*, PS3, Xbox 360* and PC. It also convert your controller into a fully modded controller without installing any chip or wires. Fully compatible with Gtuner software and with GPC script language, enabling you download or develop scripts that will give the edge to master any game. You can also use a keyboard and mouse on your video games console thru the MaxAim plugin. Compatible with PS4**, XBox One*, PS3, XBox 360* and PC. Facebook Contest Winner! #6: 600 Likes Mark. The contest still running, the next give away will be at 700 Likes mark. Your still have chance to win a free Titan One! Tell your family and friends to “Like” our Facebook page to be entered to win. 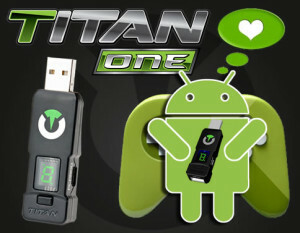 For every 100 “Likes” we will give away 1 free Titan One! Over the weekend a member (Hey24sheep) of our support forum dropped a bombshell on us. He alerted us to the fact that he is using his Titan One on his un-rooted (unhacked) Android device and it actually functioned quite well. We were shocked and amazed at this revelation as we did not intend for the device to be used on smartphones and tablets, but rather on video game console’s and PC’s. We asked this member (Hey24sheep) to create a short video, showing this in action, and he has delivered. In this video you will see the Titan One being used wirelessly with a Playstation 4 DualShock 4 controller to play a first person shooter on his Android Smartphone. You will also see footage of him using a keyboard and mouse on the same game. Also featured is a rapid fire mod from one of our existing GamePacks and a wired Playstation 3 DualShock 3 controller being used for the same game. In other words the Titan One allows you to use your favorite controller on your stock Android device to play your favorite games! And to top it off, most of the current GamePacks work as well. Not to mention, gamers can use their keyboard and mouse for the first time on their Android to play any of the popular first person shooters. While this is just a “proof of concept” and is not officially supported yet. We are very excited to learn about this and how users have found unique ways to use our little device. Official support will be worked on and testing is under way to make sure this is safe for all devices. We will also be working to make this work on iOS devices such as the iPhone and iPad. More information will be released shortly once testing has been completed.